Drill a pilot hole; enlarge the bore hole by backreaming as necessary; prepare product for pull-in at the exit end; pull it back through the pilot hole – the basic steps of a horizontal directional drilling (HDD) installation. But what if there is no place to lay out and prepare the product for pul..
Laney Directional Drilling recently completed a world-record Direct Pipe project in Cameron County, Texas. “The Gulf of Mexico Direct Pipe Shore Approach Project marked the first successful Direct Pipe shore approach in North America, as well as setting the new world record for length for Direct Pi..
Members of the Pipe Line Contractors Association (PLCA) had a busy and productive year in 2018, continuing construction of projects already underway and beginning work on new projects. “It was a good year,” summed up Elizabeth Worrell (pictured left), who completed her first year as PLCA managing d..
Jeff Awalt | Executive Editor After a period of sustained improvement, the upstream sector ended a politically tumultuous year on an unexpectedly somber note as oil prices skidded in the final months of 2018 amid oversupply concerns and signs of a cooling global economy. While these short-term tre.. The utility transmission, and distribution and communication industry had a strong 2018, but with more mixed results than anticipated this time last year. 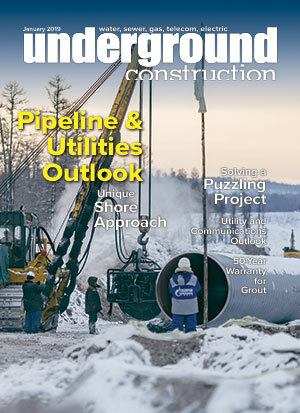 Investor-owned utilities remain in a multiyear investment cycle driven by the need to repair, replace and upgrade the transmission and distributi..
Robert Carpenter | Editor-in-Chief This is the time of the year when we start looking at the future for key underground infrastructure markets. Some call it predictions; I call it guesswork. Now more than ever, there is no certainty, no clear path for our markets. Clearly, we have become a global ..
Michael Ereti, director of capital projects with the City of Houston, was the guest speaker at the December meeting of the Gulf Coast Chapter of the Underground Construction Technology Association (GC UCTA). Ereti discussed ongoing construction and rehabilitation plans for Houston infrastructure an.. The INGAA Foundation and Canadian Energy Pipeline Association (CEPA) Foundation recently released The Practical Guide for Facility Inspectors, providing real-world guidance to ensure all oil and natural gas transmission pipeline facility inspectors maintain a uniform focus on compliance with design .. The Fiber Optic Sensing Association (FOSA) recognized Senator Jon Tester (D-Mont.) and Representative Will Hurd (R-Texas) as recipients of its 2018 Champion of Innovation Award for extraordinary leadership demonstrated in the 115th Congress to make U.S. security programs more effective through advan.. The latest American Rental Association (ARA) five-year forecast projects equipment and event rental revenues in North America will exceed $71.7 billion in 2022, including $65.4 billion in the United States and $6.3 billion in Canada. Rental revenues continue to grow, but as a slower pace. “Our for.. The National Association of Sewer Service Companies (NASSCO) has become an official sponsor of SkillsUSA, a nonprofit organization dedicated to finding solutions to the nation’s workforce challenges. “The underground infrastructure industry offers extremely viable and robust career opportunities in..
Louisiana Tech University’s Trenchless Technology Center (TTC) and the National Utility Contractors Association (NUCA) teamed up to offer the third Auger Boring School (ABS) Nov. 12-16, 2018, to meet the high demand for engineers and contractors trained in auger boring design, application and instal..
Distribution pipelines will not face track-and-trace requirements for newly installed or repaired plastic pipelines a relief for the American Gas Association (AGA), which strongly opposed that potential mandate when the Pipeline and Hazardous Materials Safety Administration (PHMSA) first proposed a ..
ISCO Industries Inc.’s wholly owned subsidiary, ISCO Canada Inc., has purchased substantially all assets of A.H. McElroy Sales and Service (Canada) Ltd., the leading polyethylene pipe fusion experts in Canada, with the largest inventory of parts, equipment and rental fleet throughout the country. IS..
clockspring.com AVT, part of Clock Spring Company, which provides a range of solutions for repairing and maintaining critical infrastructure, won an innovation award for its patented EZ Valve at the 17th Annual Chicago Innovation Awards. EZ Valve features a built-in isolation gate that allows the ..
cat.com In October, Caterpillar Inc. celebrated the 40,000th Cat large dozer rolling off the production line in East Peoria, Ill., with the customer receiving it, Teck Resources Limited, and dealer Finning Canada. Also attending were employees from Caterpillar’s Building SS, where all 40,000 Cat D..
doosanequipment.com Doosan Infracore North America LLC, selected Chris Caldwell of Roanoke, Va., as the Grand Prize winner of the 2018 Hometown MVP Contest, receiving four tickets to Game Four of the 2018 World Series presented by YouTube TV. In answering the contest question [Symbol] “How do you..
ditchwitch.com Ditch Witch, a Charles Machine Works Company, introduced an industry-first Virtual Reality (VR) Simulator to better prepare horizontal directional drill (HDD) operators for safe underground construction through cutting-edge training technology. “Our next-generation HDD VR Simulator..
Cretex Specialty Products has moved into a new office and warehouse facility in Waukesha, Wisc. With the ongoing success of its internal and external manhole chimney seals, and continuing acceptance and growth of the PRO-RING Manhole and Catch Basin Grade Adjustment System, the new space meets esse..
Vermeer Corporation purchased Vac-Tron Equipment LLC and is bringing the Florida-based company together with McLaughlin Group Inc., which Vermeer purchased in 2017. This acquisition and integration of the two companies builds on the Vermeer strategy to provide a comprehensive suite of vacuum excavat..
cat.com New additions to the Cat backhoe loader line-up, the 440 and 450 center pivot models, provide industry-leading lifting performance, high breakout forces and improved operating comfort and ergonomics. Cat 440 boasts a 25-percent backhoe lifting improvement over the 430F2 and redesigned sing..
asvi.com ASV Holdings Inc., an industry-leading manufacturer of all-purpose and all-season compact track loaders (CTLs) and skid steers, introduced the new RT-25 Posi-Track CTL. Measuring just 48 inches wide, RT-25 is the industry’s smallest sit-in CTL – easy to drive through tight spaces, while m..
John Deere introduced the latest additions to its crawler loader line: 655K and 755K. “Keeping customers top-of-mind, our goal is to provide fleet managers and operators with equipment capable of maximizing efficiency on all fronts,” said Nathan Horstman, product marketing manager, crawler loaders,..
conduxtesmec.comThe ARS610 hydraulic puller from Condux Tesmec is ideal for a wide range of underground pulling applications including power transmission and distribution cable installation, telecom and fiber. With over 10 tons of pulling force, the ARS610 offers industry-leading features, such as ..
Ditch Witch introduced Omni Bit, an HDD tool that’s built to tackle any terrain. It features a new, forward-facing cutting structure that eliminates the blunt nose for more productive drilling in the widest range of soils.The bit’s contour design allows for a larger pull hole to accommodate bigger ..
An all-new Cat D6 dozer takes efficiency and performance to new levels. The D6 XE is the world’s first high-drive electric drive dozer, offering up to 35-percent better fuel efficiency and increased agility compared to the previous, 3-speed model D6T. Constant power to the ground, continuous push a.. Hunting Energy Services has introduced a 4-inch mud motor for use with mid-range horizontal directional drilling (HDD) equipment.“We have developed a mud motor that can be use with directional drills ranging from 24,000 to 40,000 pounds of pullback,” said Klane Kirby, general manager of Hunting’s tr..
IPR teamipr.com Inland Pipe Rehabilitation LLC (IPR), a Conyers, Ga., trenchless solutions provider, acquired Daystar Composites LLC, changing its name to Daystar Composites: An IPR Company. IPR offers a wide range of installed rehabilitation solutions that restore communities with safe, smart an..
HammerHead Trenchless, of Lake Mills, Wisc., and Per Aarsleff Pipe Technology, of Aarhus, Denmark, signed a long-term, strategic partnership agreement that grants HammerHead exclusive rights to produce and distribute Aarsleff’s Bluelight LED Curing System for cured-in-place pipe (CIPP) to markets ou..
Avanti International has announced a 50-year product warranty on the company’s AV-100 chemical grout. AV-100 is an ultra-low viscosity, chemically reactive gel primarily used to seal municipal wastewater collection systems from infiltrations. “For 40 years, AV-100 has been the go-to resin material..
EDITOR’S NOTE: NASSCO just completed its 44th year and continues to set standards for the assessment and rehabilitation of underground infrastructure. As the association experiences remarkable growth, this series profiles those who have made significant contributions, and impacted the continued ac..
Download the pdf Download (PDF, 3.07MB) ..